Site Event’s urinal rental minimises queuing with the 6 man version. They are essential for any event where time is of the essence and a fast throughput of people is required. This is ideal for any sort of event where there will be large amounts of alcoholic beverages, therefore useful near a beer tent or at a festival. We offer a choice of two types depending on requirements and situation. The open ended urinal is, as the name suggests, open at both ends. Both types of urinal have a hand sanitiser dispenser to clean hands after use. 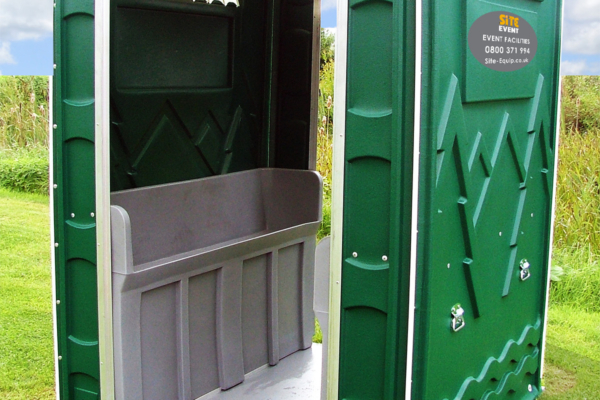 We can also provide 4 man urinals, large urinal troughs and a 20 man urinal trailer. The open ended urinal rental provides a natural entry and exit route, which in a relatively confined space is a bonus. One disadvantage to take into consideration is that being without doors the unit is open to the elements and can be viewed by passers by. This can be alleviated by surrounding the urinal by fencing or screens, creating an opportunity for advertising or sponsors names. Alternatively we can position the unit behind standard loos, if they are in an arc shape, or place adjacent to a wall or fixed object, to prevent onlookers! We do recommend that the units are kept where we place them as manoeuvrability can be impeded after use, as a consequence of the tanks being heavy when full. As with all of our grounded units electric lights can be supplied at additional cost, or we welcome customers using their own lighting, either battery or electric. The roofs are made of translucent plastic so some ambient light will filter through.